Violent crime in Central America—particularly in the "northern triangle" of Honduras, El Salvador, and Guatemala—is reaching breathtaking levels. Murder rates in the region are among the highest in the world. To a certain extent, Central America's predicament is one of geography—it is sandwiched between some of the world's largest drug producers in South America and the world's largest consumer of illegal drugs, the United States. The region is awash in weapons and gunmen, and high rates of poverty ensure substantial numbers of willing recruits for organized crime syndicates. Weak, underfunded, and sometimes corrupt governments struggle to keep up with the challenge. Though the United States has offered substantial aid to Central American efforts to address criminal violence, it also contributes to the problem through its high levels of drug consumption, relatively relaxed gun control laws, and deportation policies that have sent home more than a million illegal migrants with violent records. 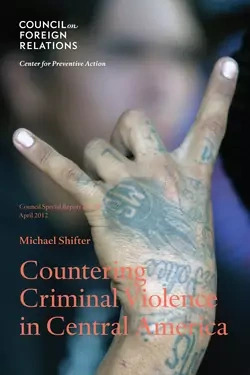 In this Council Special Report, sponsored by the Center for Preventive Action, Michael Shifter assesses the causes and consequences of the violence faced by several Central American countries and examines the national, regional, and international efforts intended to curb its worst effects. Guatemala, for example, is still healing from a thirty-six-year civil war; guns and armed groups remain common. El Salvador's ironfisted response to widespread gang violence has transformed its prisons into overcrowded gang-recruiting centers while doing little to reduce crime. Even relatively wealthy countries like Costa Rica and Panama are threatened by poor police capacity and significant problems with smuggling and money laundering. Virtually all countries are further plagued by at least some level of public corruption. While hard-hitting or even militarized responses to criminal violence often enjoy broad public support, Shifter writes, Nicaragua's experience with crime prevention programs like community policing and job training for youth suggests that other approaches can be more effective at curbing crime. Shortages of local funding and expertise remain problematic, however, and only large-scale, national programs can effectively address national-level problems with corruption or the quality of the legal system. Moreover, many of the root causes of the region's violence are transnational—the international trade in drugs, guns, and other contraband being only the most obvious example. Multilateral organizations have stepped in to support national-level responses, as have Central America's neighbors. The UN's flagship effort, the International Commission Against Impunity in Guatemala, supports domestic prosecutions of organized criminal gangs and their allies in Guatemala's government. In recent years, the World Bank and Inter-American Development Bank have contributed hundreds of millions of dollars to efforts to improve regional collaboration on anticrime initiatives; last year they pledged $1.5 billion more over the next few years. Colombia and Mexico have both provided advice and training for Central America's police services and judiciary. The United States is also contributing significant resources. Washington now provides about $100 million annually, targeted mainly at drug interdiction and law enforcement, though some funding also goes toward institutional capacity building and violence protection. Still, much more remains to be done, and Shifter offers several recommendations for U.S. policymakers. Strengthening the judiciary and law enforcement services should, he says, be a central goal; the region's ineffective and corrupt legal systems are severely hampering efforts to curb the violence. He also advocates rethinking U.S. policies that contribute to violence in Central America, including drug laws, gun control policies, and immigration rules regarding violent offenders. Countering Criminal Violence in Central America provides important insights into the varied causes of criminal violence in the region. Its authoritative and nuanced analysis acknowledges the strengths and weaknesses of ongoing efforts to address the problem, and it offers thoughtful recommendations on how those efforts might be built on and improved. Despite the daunting complexity of the challenges underpinning the region's growing violence, this report successfully argues that this trend can—and should—be reversed.